Today is the start of me branching out of my sewing corner and showing off some fun home stuff! We've now lived in our house for 3 years (so crazy!) and the wall in our living room that is along the walkway into our bedroom has remained bare. I haven't had a clue what to do with it. This is the first place we've lived that I haven't had a calendar up on the wall and it has made for some interesting mis-communications. 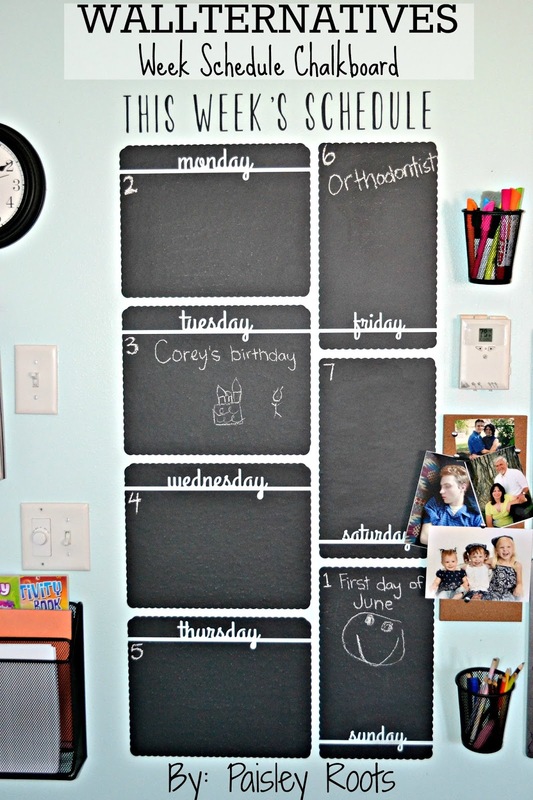 So when I was given a chance to review one of Wallternatives (a vinyl decal company that just launched) I was beyond thrilled to find they had a chalkboard schedule! Thanks to that bare wall, I had the perfect place for it too! So what is Wallternatives? In their general info you will find it says: Wallternatives are the artful alternative to ordinary walls. And then they have WallAppeal Removable Wallpaper and Etchlook Decals to look like etched glass coming soon! 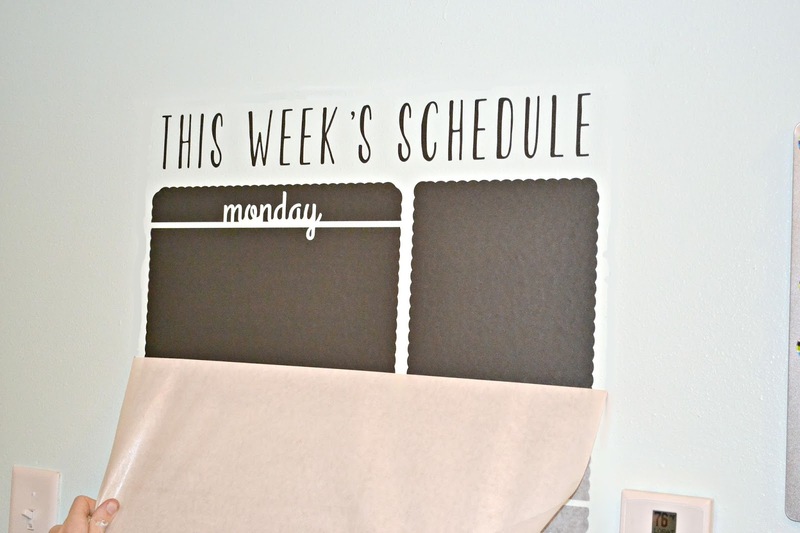 I chose the Vertical Week Schedule Chalkboard Vinyl Decal to review. These feature a slight surface texture that makes them perfect to write or draw with chalk. You can apply them to any flat or smooth surface. It's incredibly easy to put on, they are reusable and don't leave an adhesive residue. Easily washed with an eraser, damp towel or a sponge. They've been tested by a certified independent lab for CPSIA complane and is lead and phthalate free. Now that we've talked about the nitty gritty, here's some pictures to show how easy it is to put up! You just slap that sucker on, go over it with a credit card or something like that and slowly peel the paper off. It really can't get any easier. We put up a monthly calendar just so we have a heads up for the rest of the month, but the size of the weekly one is amazing. The kids have been drawing little pictures of things they'll be doing, which they love and it still leaves me space to add in anything unexpected that comes up. It also helps that my husband can't miss events! The chalk washes off really easily and with chalk, even if the kids use it on the walls, we are covered! I added a clock and bill holder. 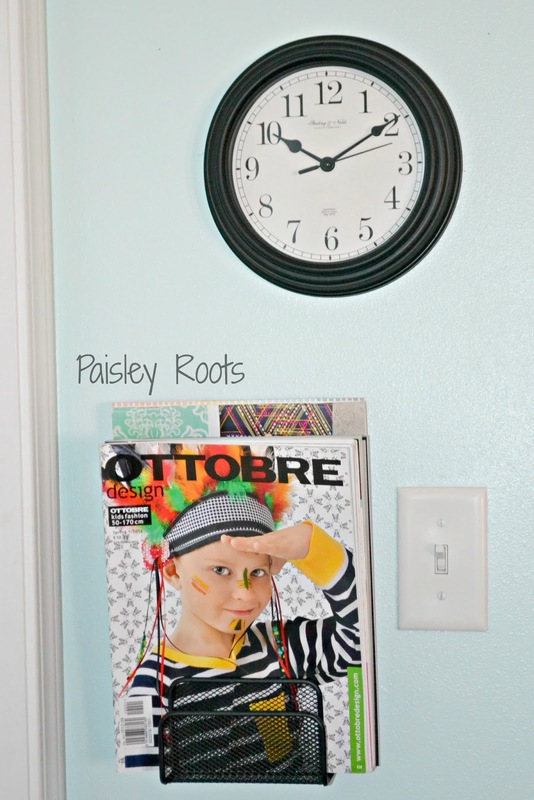 It holds the rest of my Ottobre magazines I couldn't fit over in my sewing area. 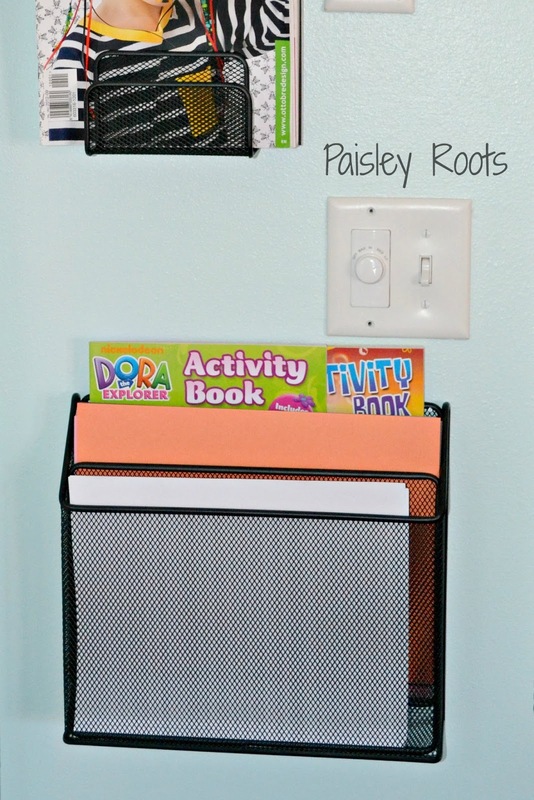 We also have a magazine holder that we added regular paper, construction paper and some activity books that are on the kids level. This way I don't have to share my paper with them and they can grab it themselves! 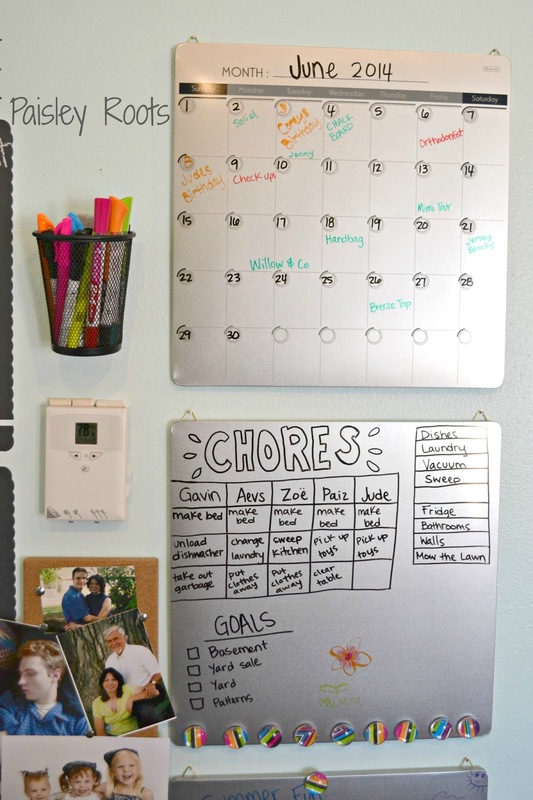 On the other side we've got our monthly schedule, chore chart, another dry erase board for the kids to doodle on, and a cork board. We had to work around the thermostat, fan knob and light switches. I think it made this wall turn out perfect and I really wish we had had this up during school! 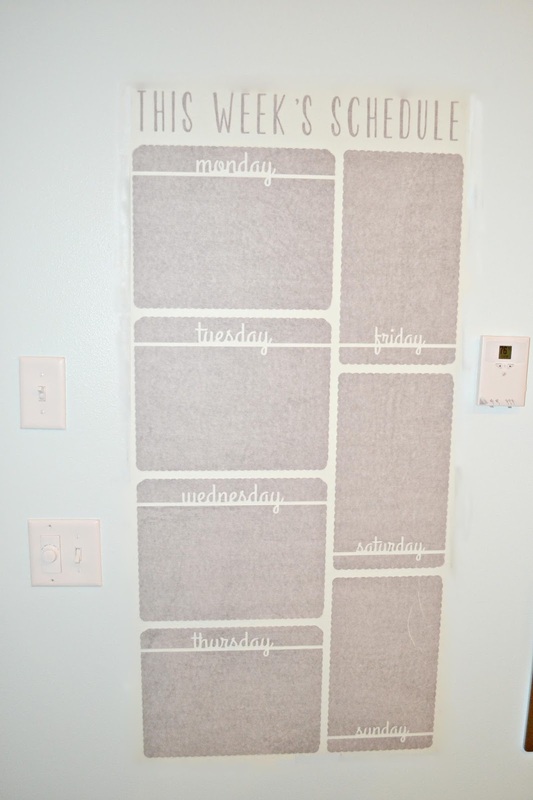 I really love this wall and love that it's now useful and practical. Wallternatives did provide me with the free Chalkboard Calendar but all opinions of it are my own and I really think it rocks! Here's some of the other decals I have on my list to get! Okay...really there's a ton I want! I think it's a great product and the fact that I can reuse them is absolutely perfect for my fickle demeanor! I love this!! Now I want a wall just like this in my house. Wow! It might have taken a few years for the right idea to make its way into your head, but once it did, it sure made for a good one! Love your wall! Looks so organized. 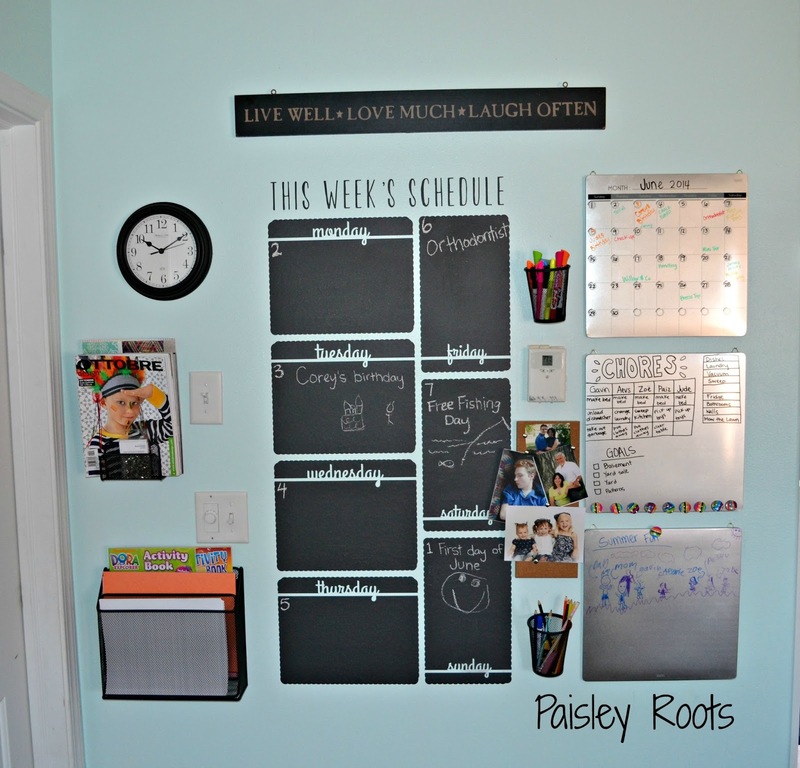 Our chalkboard week schedule wall decal looks great! 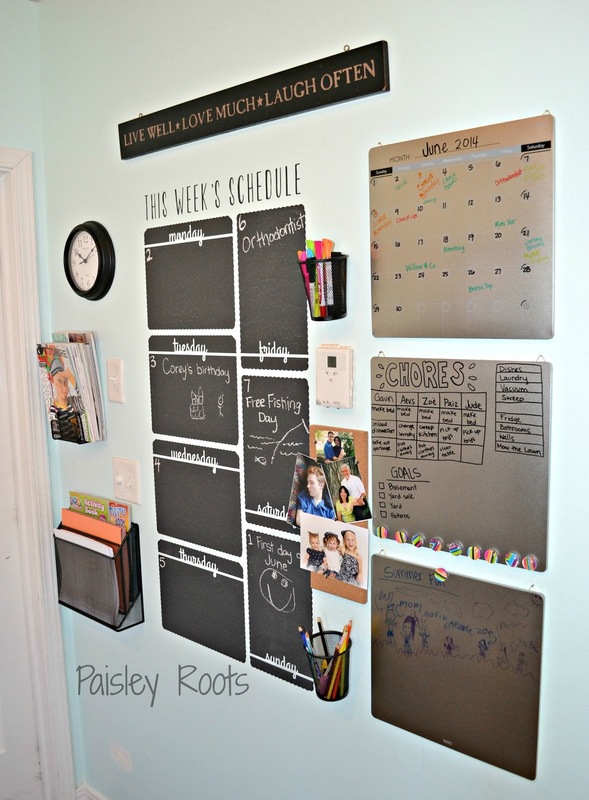 Love how all your organizational decor is all in one place! Thank you so much for using our decal- we really appreciate it over here at Wallternatives! How amazingly, super, completely, totally AWESOME is this idea!!! Looks so cool! !